Heat oil in large nonstick skillet over medium-high heat until hot. Add chicken and garlic; cook and stir 4 to 5 minutes or until chicken is browned. Stir in 2 cups water, seasoning packets from soup mixes, Italian seasoning and carrots. Bring to a boil. Reduce heat; cover and cook 6 to 7 minutes or until carrots are crisp-tender. 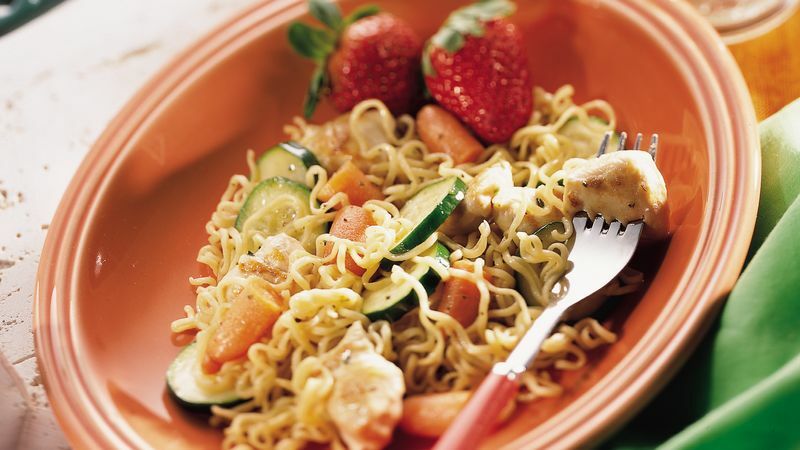 Gently break each block of noodles in half; add noodles and zucchini to skillet. Bring to a boil. Boil, uncovered, 5 to 6 minutes or until zucchini is tender and noodles are cooked, separating noodles gently as they soften. Ramen noodles are Japanese instant-style noodles shaped like curly strands of spaghetti. Traditional versions are deep-fried and thus higher in fat than the same amount of regular pasta; lower-fat versions of ramen have become available in recent years. The noodles are usually sold in packages that also contain a packet of dehydrated broth mix. Ramen noodles can be found in your supermarket's soup section.